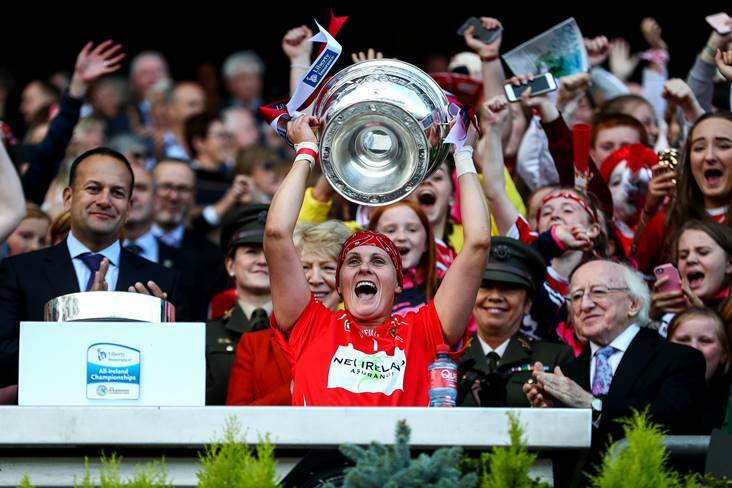 Cork captain Aoife Murray lifts the O'Duffy Cup. ©INPHO/James Crombie. All-Ireland finalists Cork and Kilkenny lead the Camogie All-Stars Awards 2018 shortlist. The final team will be announced at the 15th annual Camogie All-Stars Awards banquet, sponsored by Liberty Insurance in Citywest Hotel on Saturday, November 3rd. Kilkenny receive 14 nominations. Goalkeeper Emma Kavanagh, defenders Grace Walsh, Anne Dalton, Catherine Foley, Edwina Keane, Colette Dormer, Claire Phelan and Davina Tobin are amongst the nominees for the Cats. Meighan Farrell is nominated at midfield, whilst Denise Gaule, Katie Power, Anna Farrell, Shelly Farrell and Michelle Quilty are nominated amongst the forwards. Cork, who won a record 28th Senior All-Ireland title, receive 12 nominations. Goalkeeper Aoife Murray, defenders Pamela Mackey, Hannah Looney, Chloe Sigerson and Laura Treacy are amongst the nominees. Gemma O’Connor has been nominated at midfield and is seeking an incredible 11th All Star Award whilst Julia White and Libby Coppinger are also nominated at midfield. Orla Cotter, Orla Cronin, Amy O’ Connor and Katrina Mackey receive the forward nominations from Cork. Tipperary and Galway both receive 5 nominations as a result of their run to the Semi-Finals. Galway have goalkeeper Sarah Healy, defenders Shauna Healy and Sarah Dervan, midfielder Niamh Kilkenny and forward Carrie Dolan nominated. Tipperary defenders Mary Ryan and Karen Kennedy are joined by forwards Orla O’ Dwyer, Cáit Devane and Grace O’ Brien on the list. Waterford receive 4 nominations; defender Áine Lyng, midfielder Lorraine Bray and forwards Niamh Rockett and Beth Carton are all included. Dublin receive 3 nominations; defender Hannah Hegarty and forwards Orla Beagan and Siobhán Kehoe. Offaly have 2 nominations in defender Róisín Egan and forward Siobhán Flannery. Speaking on behalf of Liberty Insurance, Deirdre Ashe said: “Our heartfelt congratulations to all those who have been nominated for a prestigious Camogie All-Star Award. The Camogie All-Stars Awards celebrate the outstanding performances of the players who have helped to light up this year’s Championship. To be nominated reflects their skill, commitment and athleticism of the players; their nomination is deserved recognition for their performances throughout the season. "Our ‘Camogie Made Me Ready for the Real World’ campaign during the summer was designed to showcase how the skills gained on the Camogie pitch can be applied off the field in other aspects of players’ lives. The players that featured in the campaign, no less than the Camogie All-Star nominees today, are role models in their communities whose accomplishments inspire girls and young women to participate and stay involved in sport for years to come. We wish each of them the very best of luck on November 3rd”. The nominees for the 2018 Soaring Stars Awards for the Intermediate and Premier Junior Championships will be announced later this week. Midfield: Niamh Kilkenny (Galway), Gemma O’ Connor (Cork), Lorraine Bray (Waterford), Meighan Farrell (Kilkenny), Julia White (Cork), Libby Coppinger (Cork). Half-Forward Line: Orla Cotter (Cork), Orla O’ Dwyer (Tipperary), Siobhán Flannery (Offaly), Katie Power (Kilkenny), Orla Cronin (Cork), Denise Gaule (Kilkenny), Amy O’ Connor (Cork), Anna Farrell (Kilkenny), Niamh Rockett (Waterford). Full-Forward Line: Orla Beagan (Dublin), Carrie Dolan (Galway), Cáit Devane (Tipperary), Shelly Farrell (Kilkenny), Katrina Mackey (Cork), Michelle Quilty (Kilkenny), Beth Carton (Waterford), Grace O’ Brien (Tipperary), Siobhán Kehoe (Dublin). Paudie Murray (Cork), Shane Plowman (Dublin), Ann Downey (Kilkenny).